The field season for the Kilcoole Little Terns has come to an end in great celebration! This year has been incredible in terms of productivity, hatching success and fledgling success. On the day the wardens finally (sadly) departed the beach, the fledgling count was 291 fledges assumed alive. This is a staggering record and the highest ever produced in all 30 years of the project. Many have already left the site, with counts of less than 20 in the past week. With the fences dismantled, we would like to extend our gratitude and thanks to all the volunteers who assisted with the project in the 2015 season. 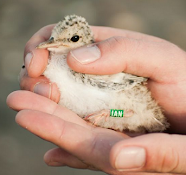 Volunteers are an integral part of protecting the breeding terns and their chicks. Such an effort requires a lot of dedication and time and the result of such work can be seen in the excellent success we have has this year. So thank you to Niall Galloway, John Wright, Fianna, Niall Houston, Candy Murphy, Chris Dobson, Jamie Ellis, Kate Bismilla, Cian Cardiff, Íosach Ó Riain, Adrienne Gallagher, Sarah Grimes, Cillian Roe, Darren O'Connell, Brian Power, Katie Manley, Jen Lynch, Niall Tierney, Ricky Whelan, Anne and Rosie Newton, Chris Webb, Meibh Foran, Lisa Doyle, Deirdre Reedy and Justin Ivory. Also a special thank you to Niall Keogh for all his help and advice, to Declan Manley for providing invaluable cover and to Seamus Doyle for repairing everything from tripods to windows!